I am having a problem with my recently purchased Kamlan 50mm f1.1 Prime Portrait Lens. I am using it on a Panasonic Lumix GH4. I am a novice, so please forgive me if I am using the terms wrong or explaining myself poorly. My problem is that the lens seems to be "zoomed in" or " too much tele" or however you say it. As you can see from the below samples, the frame only covers an area (height) of about 30 centimeters or 12 inches when filmed/shot at a distance of 2 meters / 6,5 feet to the camera/lens. Is this just what a 50mm lens does or is there some camera setting I can change to improve this (zoom out / cover a larger area) without moving the camera back. How much "better" would this be with a kamlan 28mm f/1.4 lens on the same GH4 camera? Any other helpful/creative tips or how I can work around the problem? Any help will be greatly appreciated. Thank you very much. 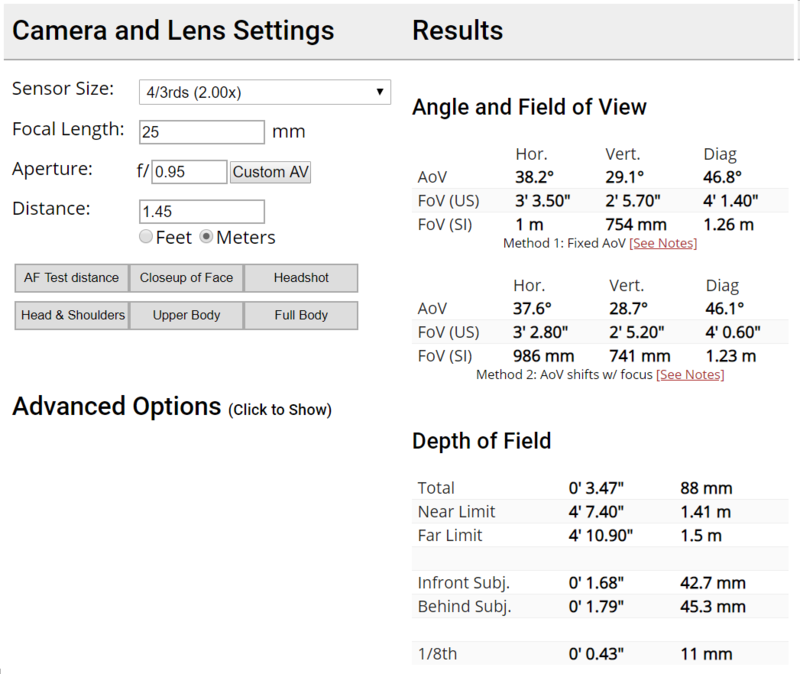 2: Yes, the vertical size shot from the same distance will be 68 cm vs. the 37 you get now. 3: No, not really other than buy a camera with a larger sensor or a lens with a shorter focal length. But if you do the first you will need to exchange your lens as well, because there are no larger sensor cameras which are compatible with the mount of your current lens. Yes, that's the angle-of-view of a 50 mm lens on a Four-Thirds sensor. It should be good for portraits, but not so good for filming yourself. It would be somewhat wider but not really wide. A moderate wide angle lens would be easier to use. Look for a lens in the 16-20 mm range for your GH4. A common but somewhat expensive solution is adapting a Canon mount Sigma 18-35 F1.8 using the Metabones Speedbooster. This gives you a very bright wide to normal zoom. It is cheaper than buying the native F1.2 primes. If you really want an inexpensive manual lens, the Zonlai 22mm F1.8 should be a better choice than the Kamlan 28mm. I have the 25mm F1.8, but I would recommend going wider. 25 mm is considered a normal prime on Four-Thirds. There are a few semi affordable manual 25mm F0.95 options if you want blurred backgrounds. These should be similar to the Sigma 18-35 F1.8 on the Speedbooster set to 35mm. There are other options like the Sigma 16mm F1.4 and 19mm F2.8 primes. I forget what Olympus and Panasonic offer. The 19mm won't give you much background blur. Thank you guys for your excellent and in-depth answers. The Canon mount Sigma 18-35 F1.8 using the Metabones Speedbooster is a bit too expensive for me, so it's down to one of the two you recommended or this Zhongyi Mitakon Speedmaster options I found. Prices are a bit random due to Danish import taxes. Do you have any thoughts on which of these would be best suited for my needs, filming and shooting portrait style with bokeh on a GH4 in fairly tight quarters? You will need the Micro Four Thirds version of any of these. There's no way to adapt a Sony E-mount lens to your GH4. I haven't used any of these, but I've read reviews. The Sigma 16 F1.4 will likely be the sharpest especially in the corners. It has quite a bit of distortion that should be automatically corrected in camera. The 25mm F0.95 lenses seem more geared to portraiture than sharp edges. There are some C-mount that can be adapted too. It looks like you can get the native mount ones for $300 used on eBay. I like my 25mm F1.8. I just bought a brand-new Neewer branded copy for $30. The 22mm is more expensive, but seems to be quite good. So acording to this calculator i found, the Zonlai 22mm F1.8 will give me a bit more field of view but a bit less depth of field. 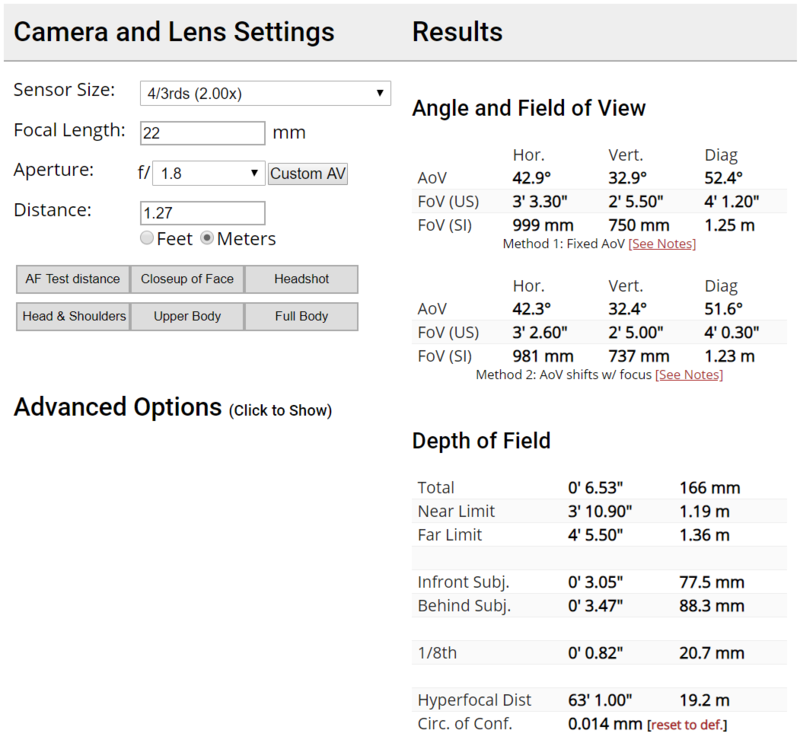 I will need to be 1.27 meters from the sensor to get my head and upper body in frame. I will need to be 1.45 meters from the sensor to get my head and upper body in frame. Yep. I like how small the Zhongyi is for being F0.95. I was considering getting the Neewer 25mm F0.95 for E-mount, and while it might have slightly better image quality, it is much larger. Can you get the Panasonic 20mm F1.7 or 25mm F1.7 locally? Those look pretty affordable. Yes, I can get the Panasonic 20mm and 25mm F1.7 locally. It's around 345 USD.